- Click "Appearances" for more information. In this meticulously researched, salt-crusted adventure tale, journalist Chris Dixon hits the high seas to bring the secrets of Cortes Bank to the surface, drawing readers into the harrowing world of the most enigmatic rock in the sea and the tremendously dangerous big wave surfing that occurs above it. He recounts stories from Greg Long, Brad Gerlach, Mike Parsons, and a cadre of divers, explorers, sailors, nation builders, and lunatics who have all tried their luck at Cortes Bank and barely lived to tell of their encounters. This astounding true story of the Everest of the sea will captivate anyone with a curiosity about, and respect for, the vast and unknowable ocean. Chris Dixon is the founding online editor of Surfer magazine. His work has appeared in The New York Times, The New York Times Magazine, Outside, Men's Journal, Surfer, and Surfer's Journal. He lives in Charleston, SC. "Ghost Wave takes us to a place of almost mythic power and tells a story that unfolds like a long ride on a killer wave. I can't imagine doing what those surfers are doing out there on Cortes Bank--and I can't imagine a finer book about them. This is a beautifully researched and compellingly written book. I read it straight through from the first page. Terrifying." "Mystery shrouded, invisible from shore, riddled with hazards real and imagined, the Cortes Bank is a sort of Rubicon. Only a handful of surfers have crossed to the other side. 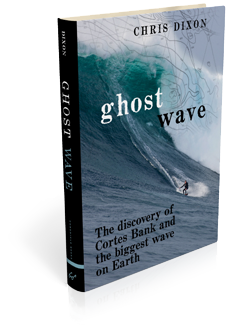 In Ghost Wave, Chris Dixon traces the Bank's maritime history, the fanciful civilization of Abalonia, and the absolute madmen who chase shifting peaks in the open ocean." "As surfers launch into the takeoff zone near Bishop Rock - the spot's highest outcropping, and thus responsible for a perfect, peeling wave - they ride above the jagged ruins of the Jalisco, an ill-fated freighter from the mid-1960s. Countless other tales come to life, the result of official documentation and Dixon's educated excursions through myths, rumors and flights of fancy."